NEW YORK (Reuters) - New York state officials told food growers and processors in mid-December that they had the state's blessing to produce and sell tea and chocolates laced with CBD, the cannabis derivative reputed to ease anxiety and other ills without marijuana's high. But since then, New York City health inspectors have seized thousands of dollars worth of CBD-infused food and drinks at the Fat Cat Kitchen and other local cafes and restaurants, and warned owners to stop selling them or face penalties. The crackdown came just weeks after federal law explicitly made CBD legal across the country. The New York City crackdown highlights the inconsistencies that have emerged in federal, state and local rules governing CBD, bewildering the small but growing number of businesses selling edibles in New York and other states. "I'm trying to be compliant with the law, but no one seems to be fully aware of what the law is and isn't," said C.J. Holm, the owner of the Fat Cat Kitchen, which touts CBD coffee and cookies on a sidewalk chalkboard. Consumer interest in CBD tinctures, topical creams and edibles has grown in recent years in step with the piecemeal legalization of marijuana, which is now permitted as either a medical or recreational drug in 33 states while still banned by the federal government. In 2018, U.S. consumers spent an estimated $300 million on CBD food and drinks, according to a report by Cowen Washington Research Group. The Coca-Cola Company and other food giants have expressed interest in the sector. The 2018 Farm Bill, enacted in December, was intended in part to clear up the legal status of CBD by legalizing cannabis extracts derived from strains of the plant, known as hemp, that contain very low concentrations of THC, the main psychoactive compound in marijuana. But the law also created new confusion for businesses wanting to sell CBD food or drink. For some, it is impossible to follow one set of regulations without being in breach of another. 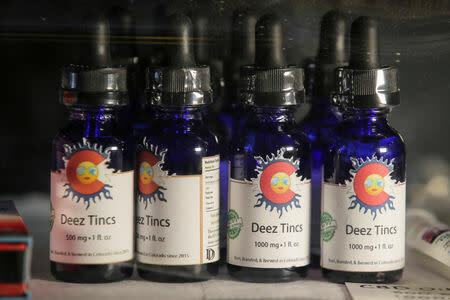 In New York, for example, officials at the state Department of Agriculture issued guidance in December saying it was legal to sell "CBD tea," "chocolates with CBD drizzle" and other CBD edibles, so long as the products are made and marketed as dietary supplements, which are governed by more stringent standards than ordinary food. But the department also warns that doing this will run afoul of rules issued by the U.S. Food and Drug Administration, which said it was unlawful to add CBD to food or to market it as a dietary supplement. That is because the agency, for the first time last year, had approved a drug that contained CBD as the active ingredient. New York City health inspectors have taken the FDA rule seriously. At the Fat Cat Kitchen, Holm was startled when a health inspector impounded her CBD powder, honey, snacks and raw cookie dough in February. Similar scenes played out at four other eateries in the city. Soon afterward, Holm and other restaurateurs received a letter from the department saying inspectors would resume the seizures after July 1. It is unclear whether the city's Health Department will allow cafes and restaurants to sell CBD edibles even as a dietary supplement, despite New York state officials saying such products are legal. When asked, Michael Lanza, a Health Department spokesman, repeated the department's position that it is following the FDA ban on CBD food and drink in any form. An FDA spokesman declined to comment on New York's regulations. Colorado, Maine and other states have attempted to clarify the status of CBD-laced edibles by passing laws allowing the addition of CBD to food. The FDA has said it may make an exception for CBD, allowing it as a food additive or dietary supplement even though it is now a listed drug. It will hold a public forum on the issue in Maryland on May 31. With the conflicting rules and at best haphazard enforcement, Holm and other CBD vendors say they are pressing ahead, devising their own strategies that they feel are at least a gesture toward compliance. Igor Yakovlev, who stirs CBD into honey on New York's Staten Island, prints a disclaimer on each Beezy Beez Honey jar stating that the FDA has not "evaluated or approved" his product. Holm, in consultation with a lawyer, noted that the FDA bans CBD being added to food for "interstate commerce," and reasons she is fine to sell CBD coffee so long as the extract is produced and processed in New York. "It is so confusing because you can ask three different attorneys and get three different answers," said Allan Gandelman, a farmer in Cortland who founded the New York Cannabis Growers and Processors Association earlier this year. "So you decide you're going to blaze a path forward, and produce a product that customers really want, and go for it until the government gets its act together."